I was at A&M when this happened! Did we get one from the Big 12? I know we were co-champs… at least once. Can’t remember. The next goal… SEC Champs! 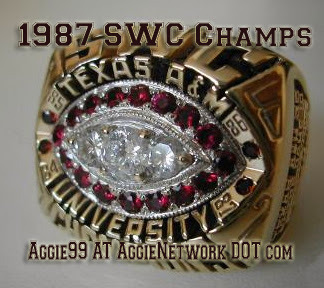 Yes, A&M did receive a 1998 Big 12 Championship ring when they won the conference in 1998 (and that was not a Co-Championship, as we won it outright). I have a photo of it, but just haven’t posted it yet (actually, I have a lot of photos that I haven’t posted yet). Will try and do it soon. As for the “co-champs” you are referring too, you might be thinking of 2010, when A&M won the South Division (but shared it with Oklahoma and Oklahoma State in a 3-way tie). Oh, and yes, a SEC Championship would be pretty darn amazing.